Visiting Whitefish? BRING YOUR BIKE. Whitefish is the start and finish of numerous bicycling tours and vacations. Bicyclists traveling with tour companies such as Adventure Cycling, Backroads, Cycle America, Off The Beaten Path and others are as common as the self-supported cycle tourist. If you begin a tour or are joining a tour in Glacier country, you may want to ship your bike to Glacier Cyclery rather than traveling with it on the airlines. We can assemble your bike, tune it or store your bike until your arrival date. We are happy to store bike travel cases while you are on your trip. If you’re shipping your bike to Glacier Cyclery, whether it be you or your local bike shop, you need to specify the things listed below on the outside of the bike box. 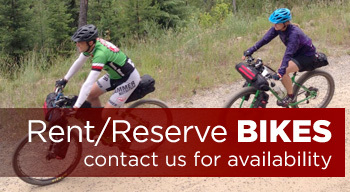 IMPORTANT: If you would like us to assemble your bike in time for your arrival or tour departure, you must call Glacier Cyclery well ahead of your arrival date so we can schedule an “appointment” for your bike. That way we will be able to fit it into our busy summer mechanic’s schedule, but you will not have to send it too many days in advance of your arrival. Thank you for your help on this! Glacier Cyclery will hold your bike until your arrival date. For a mere $10 fee you have the satisfaction of knowing your bike is stored in a dry, safe place after having been inspected for shipping damage and tagged for easy retrieval. Feel free to call us to confirm your bike’s arrival at Glacier Cyclery. 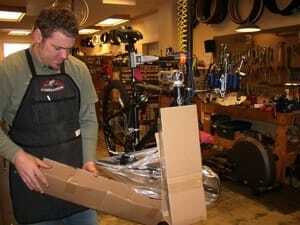 We will unpack, unwrap, assemble and tune your bike for you, then hold it until you arrive. Assembly includes installation of the accessories included with your bike such as racks, mirrors, fenders, bags, etc. During the assembly of your bike the Glacier Cyclery techs tune, secure, lubricate, and make adjustments where necessary so that your bike is in top mechanical condition for your trip. 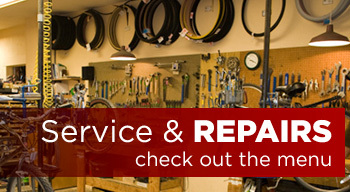 This service usually costs $60-$90 depending on the state of disassembly, number of accessories and condition of your bike; a reasonable amount for peace of mind on the road or trail. Glacier Cyclery will box your bike to be shipped FedEx Ground or UPS for $60.00, ($120.00 for a tandem). This includes the box, packing material and labor to disassemble your bike, wrap the frame in protective material, secure all loose parts and tape it up well for its journey home. If you are traveling by train and have an Amtrak box, we will pack your bike for its train ride home for $30.00, ($95.00 for a tandem), as the over-sized Amtrak boxes require less disassembly. We will also ship your bike for you after we box it up. Or if you have boxed it yourself, but have no time to get it to a UPS pick-up center, we will be happy to do that for you. There is a $10.00 handling fee, plus the cost of shipping which depends on weight, destination and the amount of insurance you desire. In order to do this we will need your credit card number. We ship bikes through UPS. 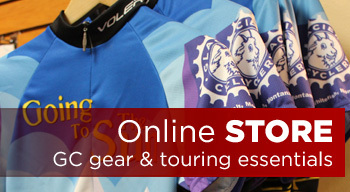 Please be aware that shipping costs are based on ‘dimensional weight’ and most bikes incur the oversized shipping fee. We accept Visa, MasterCard, and Discover.